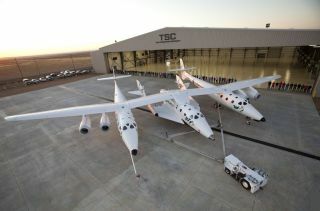 Virgin Galactic's first SpaceShipTwo suborbital spaceliner (center) is seen mated to its WhiteKnightTwo mothership in front of the "Faith" hangar at The Spaceship Company during a dedication ceremony in Mojave, Calif.
LAS CRUCES, N.M. — The burgeoning field of commercial spaceflight is at a major turning point, industry experts say. "It's not an exaggeration to say that 2012 has really been an inflection point," former astronaut Michael Lopez-Alegria said Wednesday (Oct. 17) here at the eighth annual International Symposium for Personal and Commercial Spaceflight. Lopez-Alegria, who serves as president of the Commercial Spaceflight Federation, said there is "a sea change going on" both in terms of achievements within the industry and the perception of this industry to the outside world. He highlighted major milestones from the past year, including the first launch of a private spacecraft to the International Space Station (the SpaceX Dragon mission in May, as well as its follow-up flight this month), and the continued development work on private spacecraft by companies such as Boeing, Sierra Nevada, and Blue Origin. Likewise, in the realm of suborbital spaceflight — flights that don't make a complete circle around Earth but reach space for a few minutes — a handful of companies such as Virgin Galactic, XCOR, Masten Aerospace and Armadillo Aerospace continue to test their vehicles in preparation for offering space tourist flights in the coming years. "I can't help thinking we're in the midst of something big," Lori Garver, deputy chief of NASA, said of the growing commercial space industry. "These are incredibly exciting times and I am so, so pleased and proud that NASA can play a small role." These competitions haven't been instituted without resistance by some in Congress, who question the safety and reliability of commercial spacecraft, and have pushed for less funding for private spaceflight. "Amid the mistrust and subpoenas, it's hard to remember sometimes how much progress we've made," Garver said. Many commercial space companies still face an uphill climb, both in developing complex technology and in growing a market beyond NASA for their services. "This industry loves hard stuff," Roger Krone, president of Network and Space Systems at the Boeing Company, said today (Oct. 18). "We just thrive on challenge. If we wanted to do something easy or simple we wouldn't be in this business. We all want to be part of something that's new and exciting."